MITM attack on WPA-PSK using fake AP: Can the password be intercepted from normal Windows AP-logon mechanism? I have already tested how to do a MITM attack, using a fake AP to intercept the WPA-PSK, by presenting the user to a vendor (e.g. Linksys) logon page, before routing network traffic through eth0. However, for someone with computer expertice this will probably not work. Instead of presenting the user with a fake logon page in the browser, is it then possible to intercept the passphrase from the Windows logon mechanism (seen below)? To be more specific, is it possible to configure the fake access point to fool Windows into requiring a passphrase (in the fashion below) and send it unencrypted to the AP? This would seem legitimate from the users point-of-view! Normally, the AP created by airbase-ng is open and does not require logon credentials. For your example (WPA2-Personal), the answer is no, not without bruteforcing it. At least not as long as Windows adheres and continues to adhere to the official standard. Presenting a fake login page like you did is AFAIK the only way to try to get the password, but this may indeed trigger some warnings as it is not standard behaviour. a vulnerable EAP implementation is chosen (e.g. lightweight EAP is considered very insecure, EAP-MSCHAPv2 is also broken). The general recommendation nowadays is to use EAP-TLS or PEAP-MSCHAPV2. EAP-TLS is chosen, but the supplicant does not validate the server's certificate (or you can forge the real certificate). By extension, PEAP-MSCHAPv2 will also be 'broken' in this case. Not the answer you're looking for? Browse other questions tagged network wpa2 wpa2-psk or ask your own question. Why crack WEP or WPA/WPA2 PSK when it can be sniffed through monitor mode capture? What's the risk if I accidently type my password into a username field (Windows logon)? 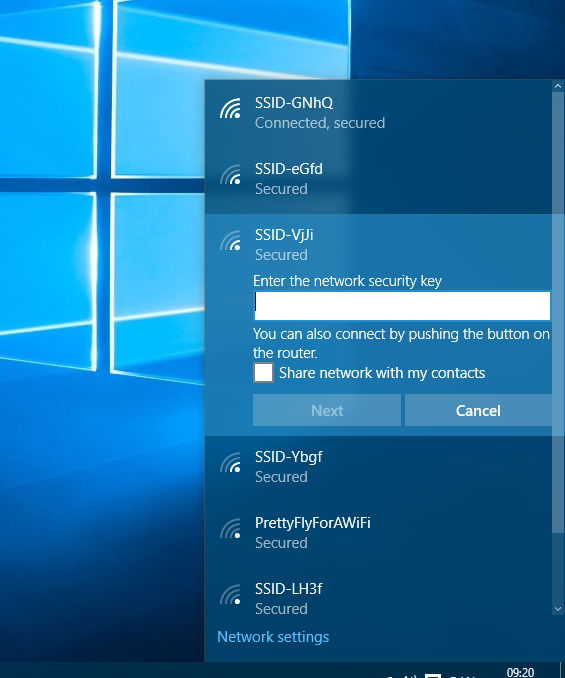 I know the WPA-PSK secured wifi password, If I use the wifi, will I be caught? Does using WPA2-Enterprise just change the attack model vs WPA2-PSK? How can I make my Windows Server accessible from another Windows PC over the internet safely, without using VPN?